Hey, Nat! How are you? What was the last thing you ate and what would you rate it out of ten? Hey – I’m good ’cause it’s the weeeeekend. I just ate a Creamy Cheese Pasta Mugshot and it was great – at this stage, I’m about 67% Mugshot, I eat so many. I rate this flavour somewhere in my personal top five although it doesn’t edge BBQ Noodles out of the top spot. For more Mugshot statistics, follow me on Twitter. One of my favourite movies is Stand By Me. I love it because I first saw it when I was only a little bit older than the characters and it struck a chord because they were scared of all the things I was scared of, like letting your parents down, like not growing up to be what you want to be and of people leaving and never coming back. I’ve seen it so many times since and it always manages to give me Feelings. I think that Chris, River Phoenix’s character, is a great tragic hero and at the end when Geordi tells us what happened to Chris when he grew up…well, let’s just it really gets me. I think I was googling around wondering if I would find anyone who was interested in my Discworld Discussions and I found a website with a vulture as the logo. So I sent a tentative email and it turned out that Jimmy – shout out to Jimmy! – was a top guy and I knew this was where I wanted to be. 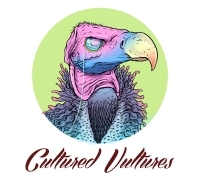 Whatever I am doing now, I consider Cultured Vultures to be the home of my internet based work. A lot of what I’m writing besides my stuff here is fiction for children, so I am not exactly findable yet. 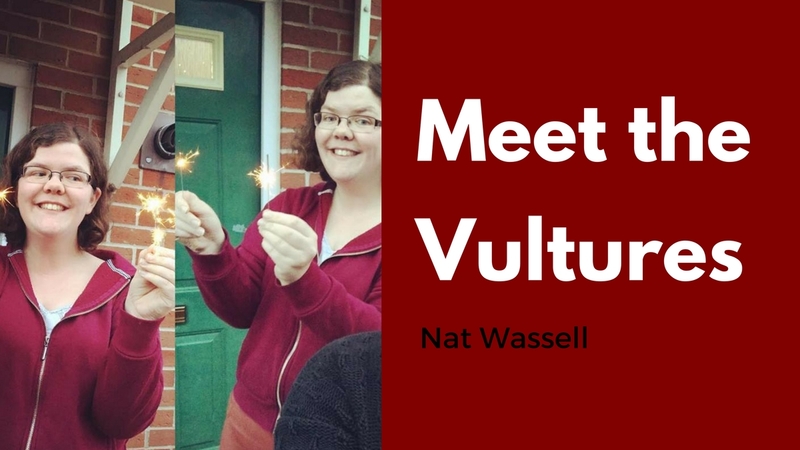 I do have a Twitter that I try to keep updated re what I am working on and I have a WordPress where I am starting to mix little writing exercises in with my Vultures stuff. Well, clearly it depends on if the kangaroo has lost the use of his dominant hand and on which teeth the crocodile has lost? Is he missing the back teeth or the front? I need more info before I can give you an answer that might not be flagrant speculation.